Google’s newest iPhone app is Gboard, a new keyboard released on Thursday that integrates the giant’s search technology into Apple devices. 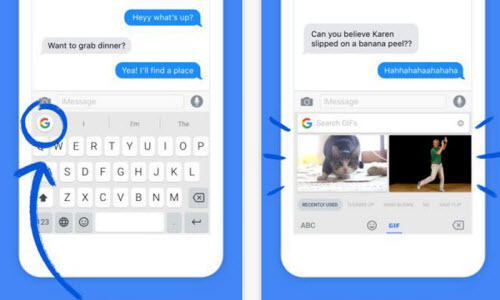 The key feature for Google’s iPhone keyboard is that it integrates Google Search into the keyboard — one example Google provides is that you can search for an address right from the keyboard, so you don’t have to copy and paste from a separate app. Other banner features include emoji and GIF search, as well as a “flow typing” feature that uses prediction algorithms so the user can type with one hand. Apple opened up keyboards to third-party developers in 2014, but there’s mixed data on just how many iPhone users use a non-Apple keyboard. This entry was posted in Apple, News and tagged Gboard, google keyboard, iPhone by IosdroneD. Bookmark the permalink.